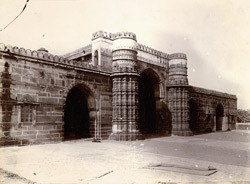 Photograph of Qutb-ud-Din Shah's Mosque at Ahmadabad in Gujarat, taken by Henry Cousens in the 1880, from the Archaeological Survey of India. This mosque stands in the northern part of the city, near the Delhi gate. It was built in 1449 by Sultan Qutb-ud-Din Ahmad II (r.1451-58). It has five larger and ten smaller domes; the central dome is raised one storey above the rest, supported by eight pillars in an eight-point star plan. The facade has three string courses running around the whole building. There are twelve windows filled with perforated stone tracery. On either side of the central section of the facade are robust minarets, terminating at roof level, decorated with Hindu-style horizontal mouldings.